Whether you’ve just moved into a new home, or you’re looking to revamp your current living space with new furnishings, finding and buying the right furniture is an important endeavour that many MALAYSIAN struggle with. You want to know where’s the best place to purchase your furniture – where you can get the highest quality items at the best prices – and you don’t want to spend hours researching and comparing stores. By shopping online at mfdesign.my , you can view a myriad of furniture products showcased in the comfort your home at any time, surf at your own pace and, what's more, we even pass on our savings on overheads to you in the form of lower prices! How can I make my purchase with confidence if I don't get to experience the actual product before buying it? We only sell items that we've carefully selected for their aesthetics and value for money. In other words, each product on mfdesign.my is something that we as customer would buy for ourself as well. We have always aimed to provide each and everyone one of our customers with affordable quality products, making all customers happy customers. If that isn't enough for you, check out the attached customer reviews and ratings, written by people who've bought the product in question. Also, all our products have gone through 100% quality checks before every delivery. So, nothing to worry. What if the furniture doesn't fit well in my home after I've bought it? Our customer service officers will be more than glad to assist you with the product dimensions and provide as much details as possible for you to make an informed decision. Otherwise, you can also refer to the various dimensions as specified on each product description before making your purchase. Why your price so low? Do you sell used, reconditioned or refurbished furniture? No. All our products are brand-new from the manufacturers, with their original tags and in their original packaging. - Long standing relationships with our suppliers. Can we trade in our old furniture? Sorry we do not take trade in. Imagine for those who do trade in of old furniture, what do they do with it? Either they refurbish it and resell it or they factor the cost into the price of the furniture you purchase. We want you have the best value product, so we only sell brand new furniture. What happens if the goods received is defective? We will change it at the earliest possible date with no extra charges. Place your order simply by clicking on your desired item, stating your preferred size or colour and selecting the "Add To Cart" option. Once you're done filling up your virtual shopping cart, follow the step-by-step instructions on your screen. You can choose to have purchased products delivered to your doorstep. Deliveries are usually made within 7-14 working days, depending on the availibility of stock in our warehouse and your delivery destination. You're able to pick a suitable delivery date and time slot from the available ones when you complete your order online. For most products, you can select online payment with your bank card / credit card . We do not accept cash on delivery (COD) at the moment. Delivery is usually within 7-14 working days, unless otherwise stated. Some places with less lori trip will have longer delivery lead time for around 2-3 weeks. You will be able to select your preferred delivery date and time frame when the order is placed online. You will receive an order acknowledgment via email. Can I change the item and delivery date after I place my online order? Yes. Please notify us on any changes or cancellations at least 48 hrs prior to the original delivery timeslot by emailing orders support@mfdesign.my . For immediate assistance, please call 018-2011768 during our office hours.We'll try our utmost to deliver the changes, but there might be delays depending on the availability of your new choice in our stock or slots in our delivery schedule. Can you help to dispose my old furniture? Sorry at the moment we do not provide delivery service to Singapore. We may help to deliver to Johor Bahru but for delivery to Singapore you may need to arrange transport by yourself. Sorry for inconvenience caused. How will I know if my current mattress would fit in your bedframes? Our bedframes are manufactured to accommodate all standard-sized mattresses. I saw a mattress in another store but I can't find it on your website. Can you get that mattress for me? Here's a trade secret: it's a common industry practice to place different labels on the same model of mattress and distribute it to different retailers. In other words, the same mattress model manufactured by a mattress company may be known by different names in different stores. This 'differentiation' is for retailers to differentiate themselves and maintain the image of exclusivity to bring up the profit margin. The mattress you saw may just be one of our mattresses! Please take note of the brand and name of the mattress, contact us and we'll help you find out if we're carrying the same model of mattress that you saw. Can I customise my mattresses and beds with you? Yes of course! Please contact us with your desired dimensions and specifications to get a quote. I would like to make a bulk purchase. Will I get a better price? Bonnell springs, or open coil units, are spring units which are connected together. This is about the most conventional mattress spring system that's in the market today. Many large mattress manufacturers favour the open coil unit for its low production costs and tension variety. Bonnell spring mattresses generally feel harder compared to pocketed spring mattresses and tend to result in partner disturbance as they're connected together. Individual springs are wrapped in a fabric encasement to create pocket springs. Each coil works independently providing a moderately even conforming to your body contours. This individually pocketed springs also means that partner disturbance is reduced to an almost absolute zero in some of the better mattresses and is perfect for those who find themselves kept awake at night by the tossing and turning for their partners. Memory foam, also known as visco elastic foam, was originally developed by the National Aeronautics and Space Administration (NASA) to absorb the G-force during space shuttle takeoff. 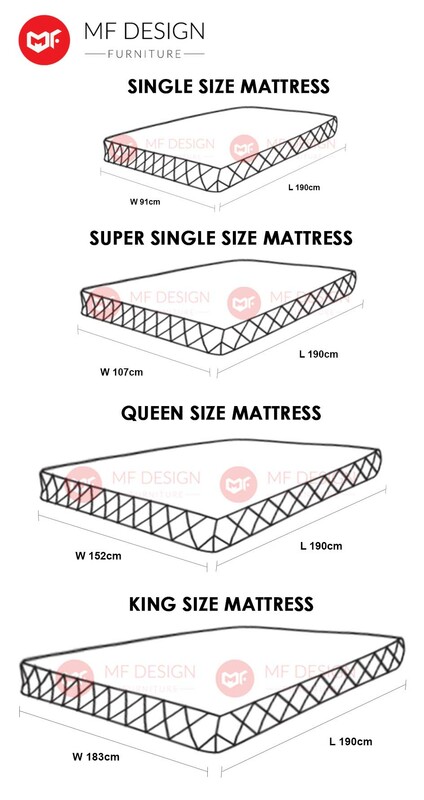 Its unique quality of bouncing back into its original shape has made it an immensely popular material in mattress making. The visco-elastic memory foam is also heat-sensitive. In layman terms, that means that it hardens temporarily when in contact with your body due to your body heat, to create a support in the firm shell that forms. This unique material also distributes your weight even over the surface area of your body to relieve common pressure points. Memory foam mattresses are also highly recommended for those who suffer from scoliosis and arthritis. What is Latex Foam Mattress? Latex rubber is a milky liquid that's tapped from the trunks of rubber trees in Thailand, Indonesia and Malaysia. Latex foam mattresses conform perfectly to your body contours for superb comfort and proper orthopedic support that maintains spinal alignment. Latex is inherently hypo-allergenic and its anti-microbial properties reduce the growth of common bacteria and mildew, making it particularly beneficial for those suffering from asthma or various allergies. In recent years, synthetic latex, a material that mimics some of the best qualities of latex, has emerged as a cheaper option. Some manufacturers have also begun to mix synthetic latex with natural latex to cut costs. Difference between Memory Foam and Latex? Memory foam is a man-made polymer developed from polyurethane while latex is a natural substance. Apart from memory foam being slightly denser than latex, it also tends to leave a slightly longer impression due to its heat-sensitivity.